If you have never rented a dumpster before or even if you have rented a dumpster before, you probably though, how do I find a dumpster rental near me? It can be hard to find out what companies are local when it seems that everyone one you call is not located in your area. In fact, most dumpster rental companies are not local or are not even a dumpster company, but a broker. Brokers simply take your order, find the cheapest person to do the job, mark it up, and then the 3rd party brings you the dumpster rental. The big companies and brokers are the most expensive dumpster rentals. The big companies have brand recognition, love to go for after the big contractors, and are regional. Sometimes the big guys will team up with broker to create a perfect mistake! Brokers simply run adds and market their company as the source, but when they actually just find a local guy to do the work and add an significant amount of money to the cost! They are a 3rd party company. Using a local dumpster rental company will not only save you money, but you will also get a true idea of all the cost (no confusion), better service (less layers), faster service, and less fees (pre and post). How do you find the dumpster rental "near me"? For one visit their website and look for the following: address, local phone number, see where their reviews are coming form, and look for social media links. Social media can tell you a lot about where a company is located, too! Another great place to look in google maps. Maps will search by your IP address and list companies near you, but sometimes brokers will have listing in your area. A local listing should look something like this. Another indicator is look at the company name. If it is a blanket or general name; ie Budget Dumpster, Local Dumpster, Cheap Dumpster, Easy Dumpster, Quick Dumpster, etc it is strong indication that they are a broker. Landfills and transfer stations are a good place to call and find out who the local guys are, too! 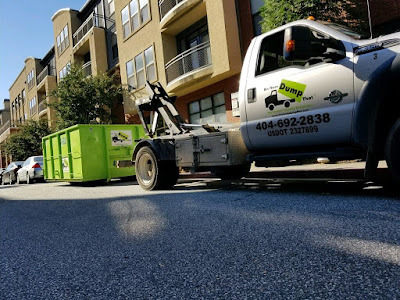 The simplest and quickest way to find out where the dumpster rental company is located is to ask them; this way you know for sure where they are. Brokers and regional dumpster rental companies try to avoid letting you know that they are not local. Brokers also try to avoid you figuring out that what they really are, a third party or subcontractor. Remember, these guys are significantly more expensive, too! "A few days later they charged me additional 44 dollar for who know what. Looking at the reviews, it seems to be quite common in their practice. Lesson: if they claim to be the cheapest, they will charge you afterwards." Nataliya L.
"This is not even a dumpster company. This is a third party referral service . If you are located in Atlanta, Marietta, Roswell, Sandy Springs, Dunwoody, Brookhaven, Chamblee, Kennesaw, Acworth, Dallas, Hiram, Douglasville, Villa Rica, Mableton, Smyrna, Powder Springs, Atlanta, Decatur, Buckhead, East Point, College Park, Union City, Fairburn, Peachtree City, Newnan, Carrollton, Lithia Springs, or any part of metro Atlanta you can the dumpster rental "near me" company; Bin There Dump That. We are the only company designed around residential use. We provide clean dumpsters, 100% driveway protection, post job clean up, and double doors for easy walk in loading.